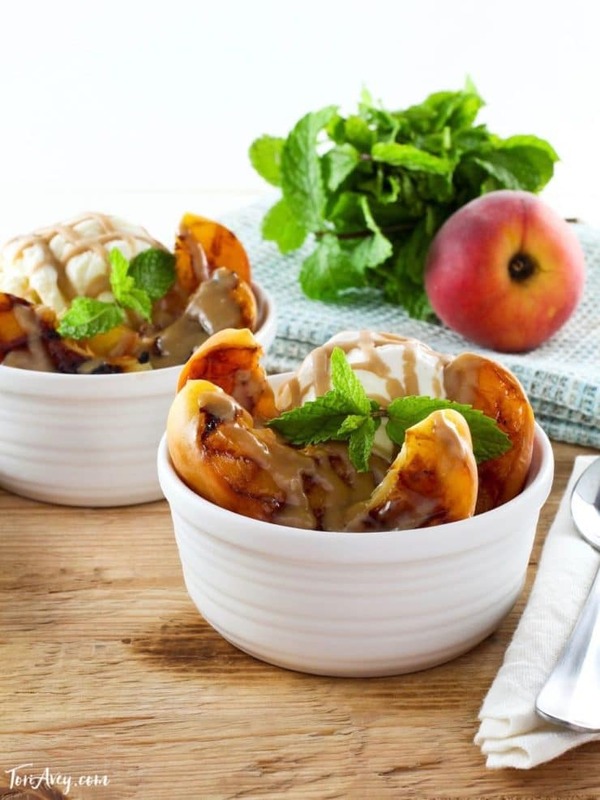 Grilled Peach Sundae with Brandy Butterscotch Sauce – Recipe for grilled ripe peaches and creamy caramelized sauce over vanilla frozen yogurt. King George IV ruled the United Kingdom from 1820 to 1830. During his ten-year reign he became known as a glutton, a hedonist, and a passionate lover of peaches. He enjoyed the fruit so much, in fact, that the supplier of royal peaches could not provide enough to satiate him when bad weather destroyed part of their orchard. This was a difficult truth to swallow for a king accustomed to getting whatever he wants, whenever he wants. Alas, the trees were badly damaged, and even a king’s command couldn’t force them to bear fruit. The king was forced to cut his peach consumption in half. George IV preferred his peaches stewed in brandy. 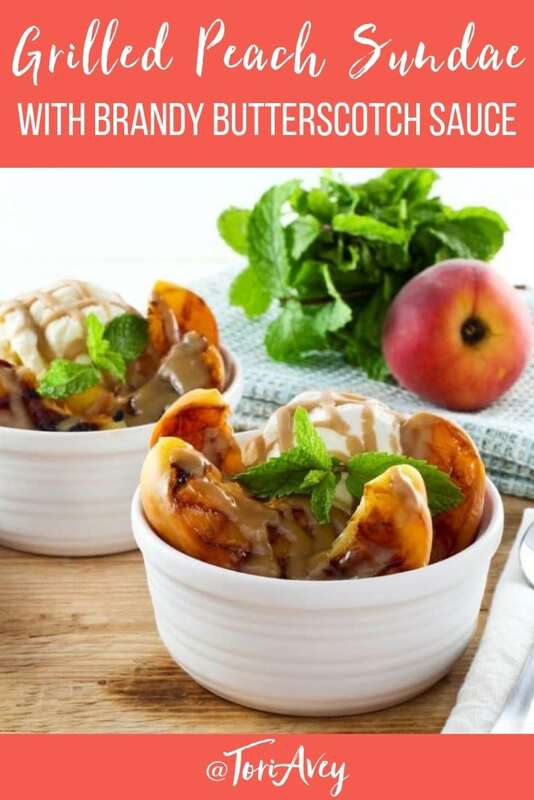 Here, I’ve grilled ripe peaches and served them over vanilla frozen yogurt (the tartness pairs well) or ice cream, topped with a scrumptious brandy butterscotch sauce. I am convinced that old Georgie boy would have asked for seconds. 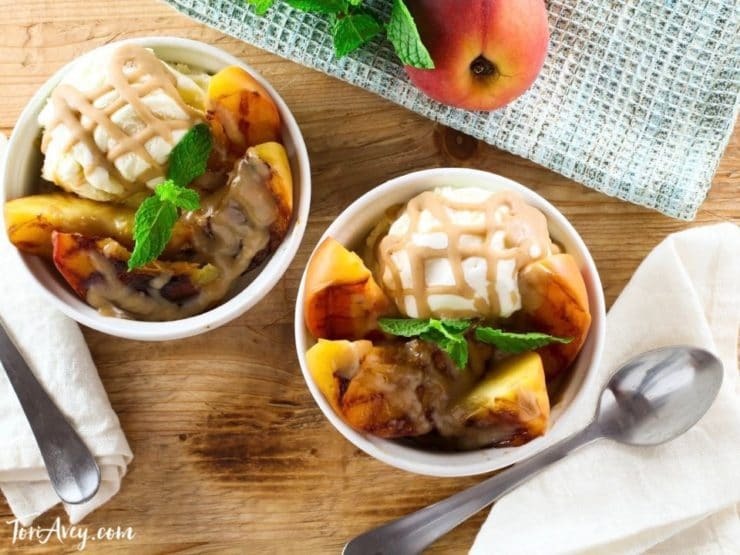 Recipe for grilled ripe peach sundae with creamy caramelized sauce over vanilla frozen yogurt. 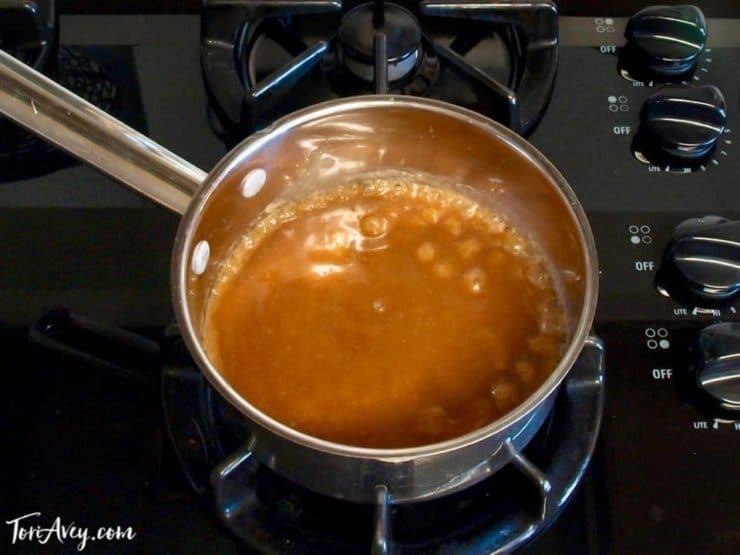 In a heavy-bottomed saucepan melt the butter, then whisk in the brown sugar, 2 tbsp heavy whipping cream and pinch of salt. Whisk together the ingredients until smooth, then bring to a simmer. Let the sauce simmer for 3 minutes without stirring. Remove from heat and whisk in the brandy and 1 tbsp heavy whipping cream. Let the mixture cool slowly in the pan, whisking every so often, until the sauce is warm but not hot. Meanwhile, halve the peaches and discard the pits. 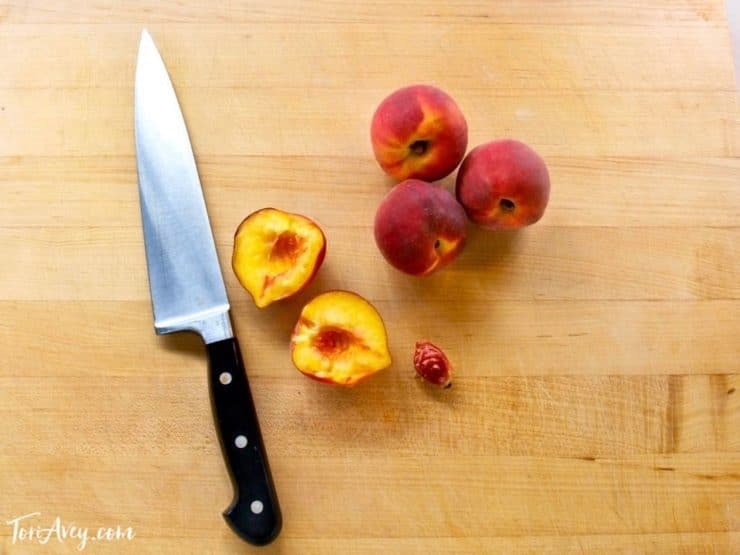 Brush the peaches on their cut side with maple syrup. Grease or butter a grill pan and heat over low. 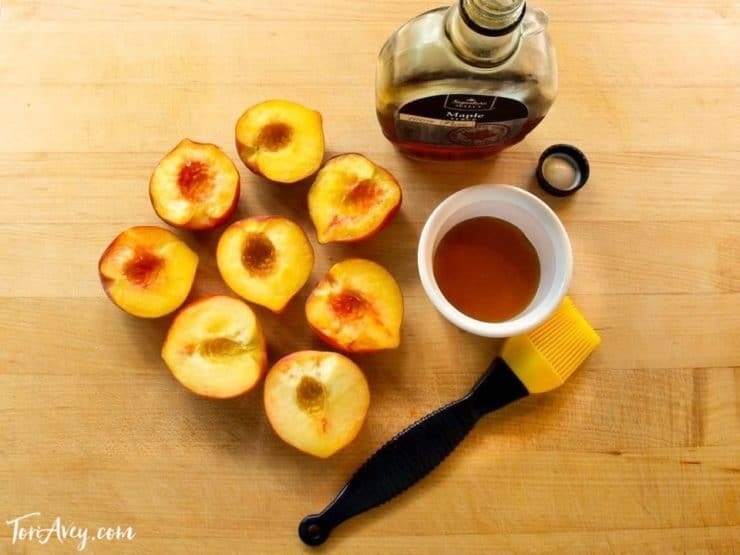 Grill the peach halves for a couple of minutes until grill marks appear. 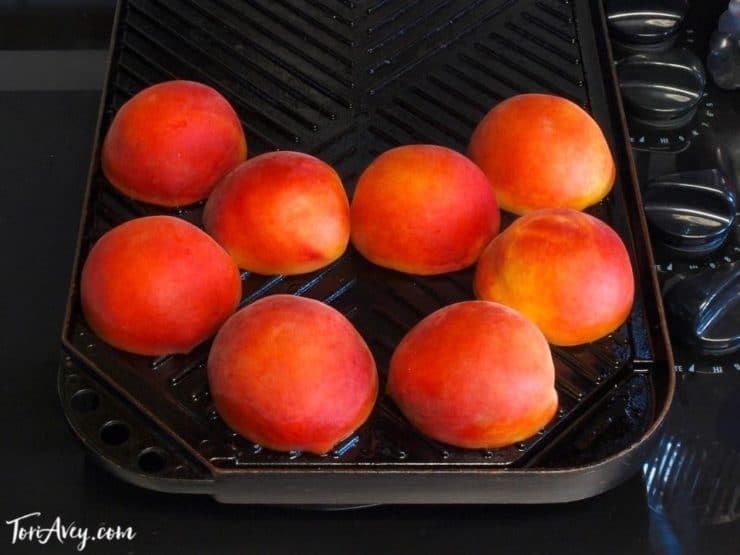 Rotate them again and continue to grill until more grill marks appear and peaches are heated through. Do not let the maple syrup burn or blacken beyond the grill lines. 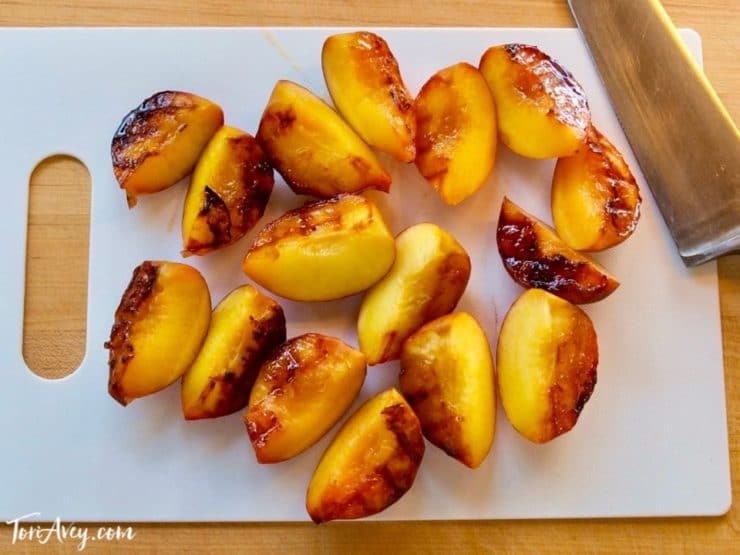 Halve the grilled peach pieces again to make quarters. 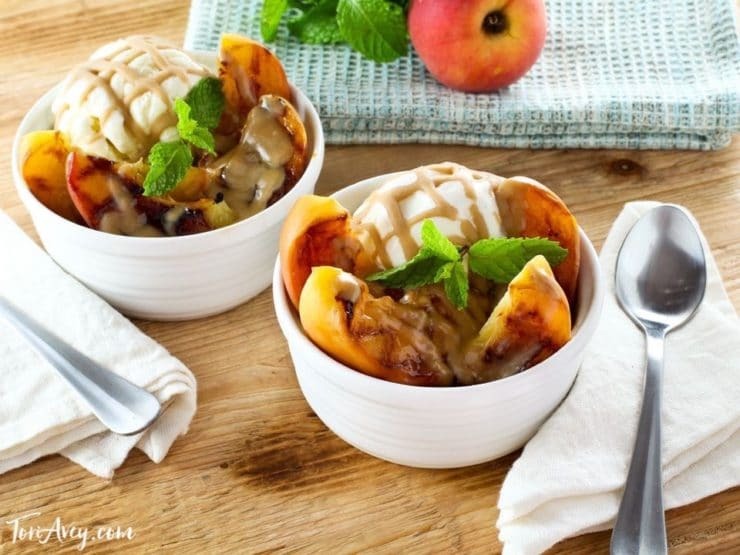 Scoop vanilla frozen yogurt into four dessert bowls. Add four peach quarters to each bowl of yogurt. 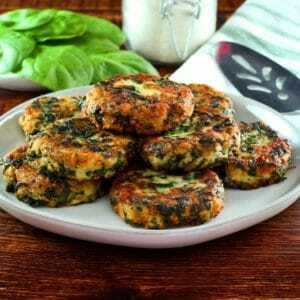 Drizzle each serving with the warm brandy butterscotch sauce, then top with a sprig of fresh mint. 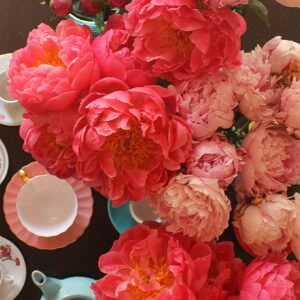 Gorgeously simple recipe. Easy enough for an awesome week night splurge. Thanks Tori! Love your recipes. Why you don’t specify the calories? 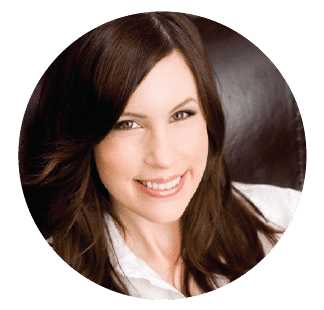 Oana I am currently working on adding a calorie system to the recipes, it will take some time to update the site as I have hundreds of recipes. Wish u would put entire recipe on the page. Would make life much easier as I cannot get to your post. Hi Nancy, I’m not sure what you mean – the entire recipe appears on the page above. Do you mean a printable version without pictures? 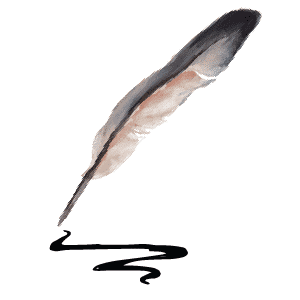 Just press the print button and it will create a print-friendly version. Let me know if you’re having trouble seeing the post, if you are please give me your browser so I can troubleshoot the issue. Omg. Now that is my kind of meal!!! !